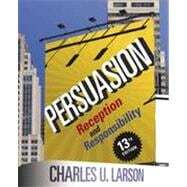 Combining the latest developments in persuasion theory, research, and ethics, PERSUASION: RECEPTION AND RESPONSIBILITY, 13e helps readers develop skills as critical consumers of all forms of persuasion. It presents persuasion by examining politics, mass media, advertising, and the Internet as it challenges readers to consider how the persuasion process is affected by today's 24/7 networked and media-saturated world. The new edition offers an expanded emphasis on ethics as well as increased coverage of the impact of fast-growing social network media. Packed with vivid illustrations and real-world examples, PERSUASION: RECEPTION AND RESPONSIBILITY, 13e demonstrates persuasion in action and encourages readers to apply what they learn to everyday life.